Naughty Dog company, the developer of The Last of Us, has announced the game’s pre-order, Season Pass and 3 first DLCs for this action. The Last of Us digital edition pre-order and its Season Pass are available from today in PlayStation Store. Those who pre-order The Last of Us will receive a unique download installer which downloading only 50% of the game, will allow you to start playing The Last of Us. 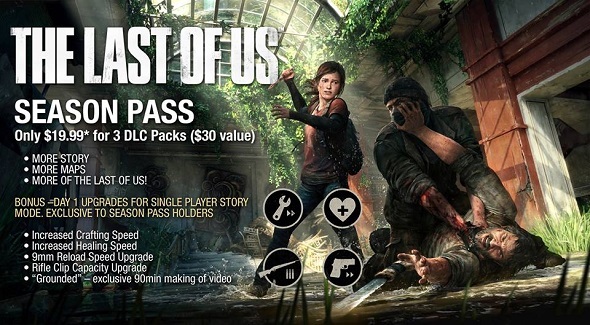 Season pass, costing only $19.99 / €19.99, will consist of three downloadable contents and exclusive bonuses that will be available only after The Last of Us release. These bonuses (called "Day 1") aren’t only a variety of game improvements (crafting speed increase, healing speed increase, 9mm reload speed upgrade and rifle clip capacity upgrade), but also an exclusive hour and a half documentary film about The Last of Us creation. We haven’t a lot of information about The Last of Us DLCs. But we have already known that one DLC is for single-player campaign, the other two are the additional content for multiplayer in the form of maps and weapons. For those who want to buy all three DLCs, we would like to recommend to buy the Season Pass, because in this case you will save almost 30% of money. And, as always, we don’t forget to remind you that The Last of Us release is scheduled for June 14 exclusively for PS3.